A dancing doll bobs on a string of beads slung from the top of a grimy windscreen, swinging back and forth like a hypnotist’s watch. The emaciated figure has a white beard and is dressed in a loose-fitting skullcap and long tunic of white. Meet the Indian mystic Sai Baba of Shirdi; a holy man, guru, sufi or saint, who may have been Muslim or Hindu – nobody seems too sure. I’m taking an open-sided auto-rickshaw – túk-túk in local speak – from the office back to my hotel. The trip takes an hour now that Mumbai is awake. Roller doors shuttered this morning are now wide open. Teams of tradesmen toil in fluorescentlit sweatshops gathered in dedicated neighbourhoods; now we’re passing furniture-makers, next monumental stonemasons with grit-covered faces. Other shopfronts are cluttered with a miscellany of new and used car bits. Moban yanks ferociously at the handlebar and I’m speechless with fright when he ignores a red traffic light. But he is nonplussed – even surprised – at my panic. “What is the problem sir, are you not safe?” To my horror Moban has revolved in his seat, his beaming round face now directly in front of me. To make things worse, an oversized truck is pressed up against our rear. There are honks, and something sounding remarkably like a disgruntled foghorn from a dusty red bus with a dark face pressed against every window. “You should not worry about traffic lights here in Mumbai, sir. You are with Moban, the best túk-túk driver in all the world; and the lights, sir, they are not compulsory.” He returns to the driving with a mischievous chuckle. But it seems I am a worrier. I worry about feeling vulnerable in this flimsy shell of a túk-túk and I worry about túk-túks being so low in the traffic pecking order, with only pedestrians, cyclists and wandering dogs further down the scale; and I worry about the games of bluff Moban plays with other túk-túks. Rocking his head from side to side, he informs me that elephants are good luck. “Well, sir, I am very much hoping to meet an elephant one day,” he adds. Shuddering at the thought, I shake my head and for a fleeting moment wonder if that Indian habit is contagious. Moban twists in his seat again. “Oh don’t worry, sir,” he cackles, “there are only three elephants in the whole of Mumbai.” For one scary moment he actually takes both hands off the handlebar to emphasise the point. Wiping a stream of sweat from my face, I’m reminded by the wobbling Sai Baba that patience, contentment and inner peace are a virtue, while daredevil kids dart between cars, juggling stacks of secondhand books for sale. We’re in a world of sellers and beggars that Moban fails to notice; one haggard man has no teeth and jaundiced eyes, and a mother holds out a hand for money while pushing a snotty-nosed baby so close that the blood-stained bandage wrapped around the kid’s arm brushes my face. Hi Ian. That was quite an unsettling ride. The lights are not compulsory? Yikes lol! Oh, and with the driver’s mischievous chuckle, I’d be a worrier too. I’ve heard that elephants are good luck but I doubt I’d want to see one while taking that ride. Assume you made it home safely though. 🙂 Interesting post, felt like I was taking that ride with you. If I ever get to Mumbai, think I’ll avoid taking the túk-túk. Yes, a bit scary @ times. But I did generally travel in those little beasties; maybe being a kid @ heart. That is an amazingly true vignette of Mumbai. I couldn’t suppress a smile at your alarming tuk tuk ride. Thanks to a population bursting at seams, the damned things are at a premium. 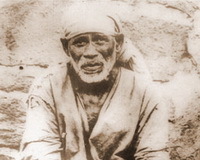 Sai Baba is an epitome of endurance and forbearance. At times then, you just have to close your eyes and surrender yourself to destiny like a sitting duck. Glad you liked the trip. Mumbai bursting @ the seams? Sure, but what an amazing place you have there.